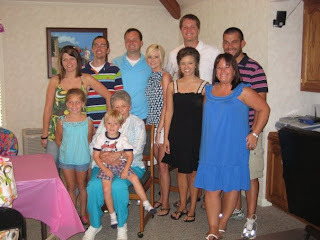 Tomorrow, Saturday, August 1, 2009 my sweet Papaw turns 85 years young! Papaw, (or Gerald, as he's known to his friends), is my dad's dad and one of the best men to ever walk the face of this beautiful world. Papaw has the energy, wit and sharpness that rivals most 25 year olds I know. He is an expert mechanic with over 65 years of experience and people from all over the state of AR (and beyond) still call him to this VERY day when their cars break or they have an electrical question. Papaw reads constantly, watches television, enjoys his computer and, for the past year, has been exploring the Internet. He recently even joined Facebook to keep up with his family and numerous friends from church. He truly is one of those people that believes you have to change with the times. I know this is what has kept him so sharp all these years. Most importantly, Papaw has been an amazing role model for all of us grandchildren. 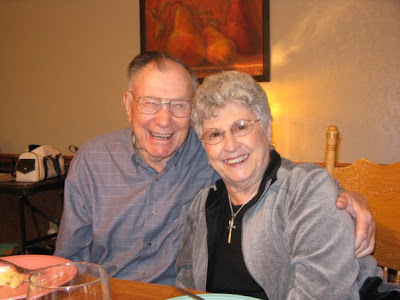 He is a very strong Christian man and has been my Memaw's husband for well over 50 years (a task she'll even tell you, can be a challenge sometimes! Haha!). So this one is for you Papaw...may your special day tomorrow be filled with happiness, laughter and lots of buttercream frosting. Love, Leslie. Ladies, we have a trend alert! I've actually seen these on several stores online, but alas, they are just now hitting regular stores. They are called Fish Tail bracelets and I think they're adorable! Inspired by the original Fish and Archer Bracelets (seen below), these nifty accessories are part Penny Lane/ part Tinkerbell. Alright, this may change when I’m not 24 anymore…but I doubt it. You see, I’m a big believer that birthdays should be celebrated to the fullest extent. I’m talking flowers, a pretty cake, lots of presents, streamers, confetti, cards with money…ok, you get the picture. So in honor of all you fabulous ladies out there, I’m going to open a new gadget on the blog called “You Say It’s Your Birthday”. At the beginning of each month, I’ll list the readers celebrating their b-days. So this way, we’ll all be able to send a birthday shout out to our dear blog-reading friends, no matter where they are. If you would like to send me your name and birthday, just leave it in the comment here, or email me at askblondeambition@gmail.com You don’t have to tell me your age (unless you want to) but I’d love to be able to remember your special day. 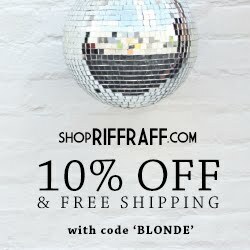 I was doing my nightly blog surf and came across this lovely (honestly, it's so pretty) website that features an online store, blog and design studio called a.muse. 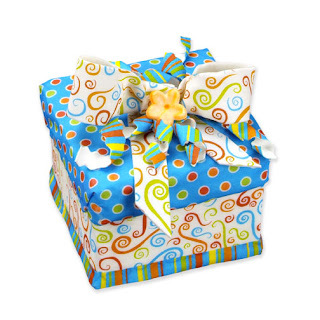 They feature artsy/crafty things like cool paper, trendy stamps and much more for the aspiring Martha Stewart. As a former English major and total book nerd, reading has always been my go-to way to relieve stress. I would take a good book over a good movie just about any day of the week. 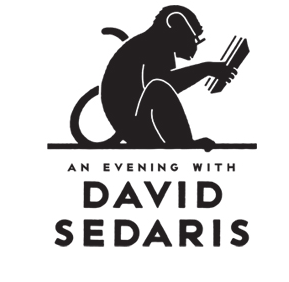 David Sedaris is hands down my favorite writer off all time, (next to Eudora Welty and Augusten Burroughs, of course), so you can imagine my excitement when I found out that he will be at the Walton Arts Center in Fayetteville on Tuesday, October 13! Wanna go too? Click here to purchase your tickets today! Now, for the big question.....What will I wear!? So as most of you already know, I have a major passion for fashion. I've been searching the internet and perusing magazines to get the skinny on the hottest trends for fall 2009. Ooohhh this makes me excited about shopping the pre-season sales! 1. 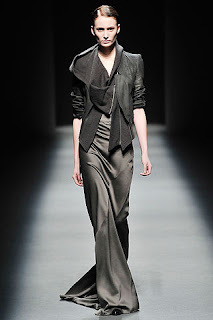 The Biker Jacket- Designers are going crazy this fall for leather jackets of all sorts. Whether you wear it with skinny jeans and tall boots, or pair it with a pretty dress (great contrast of soft/hard), this trend is bound to stick around throughout the cooler months. Wear yours short or cropped and fitted, otherwise you run the risk of looking like a mob boss. 2. Lace Tops- Lace is this season's must-have material. Lace tops are going to be popular, especially black and taupe colored lace blouses. Pair your lace top with a pretty pencil skirt or trouser pants. And ladies, make sure you invest in a well-fitting bra...lace can be a tricky material to wear, so a seamless undergarment is essential. 3. Bright Pencil Skirts- A great neutral pencil skirt will always be a wardrobe staple. But this season, don't be afraid to show off those gams in a pencil skirt of a brighter hue. Colors of mustard and turquoise dominated the fall 2009 runway previews. 4. 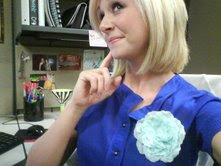 Flower Pins- As my post on Friday indicated, I'm a huge fan of this trend. Lucky for all of us, it will stick around through fall, so now is the time to invest in some flower power. You can get these nifty little pins for your cardigans at NY and Company or, if you're crafty, make them yourself. Wear 2 or more at a time for a really dramatic look, (as seen below) , or just 1 to complete a work appropriate ensemble. 5. Ruching- "Ruching" or "bunching" is a technique that designers use to bunch material for a more layered look. It adds volume and drama to any top or dress and can really up the "wow" factor. Ruched tops and dresses were seen everywhere on the runway this season and, even better, ruching can help to hide those lumps and bumps we've all got. The fall fashion waters are heating up, so dive in head first! So what triggered my "Augustus Gloop" moment? 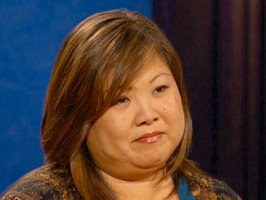 Well, you see I've been watching Food Network all weekend and was tuning into one of their cake challenges. 5 episodes of butter cream frosting and rice crispy treat layers and...well...I just NEEDED something sweet. So indulged in an entire bar of Swiss chocolate. I loved every calorie-laden moment of it, too! Well, I'm off to make marketing miracles happen (haha!) Have a great day and don't forget to thank God for all the good things in your life today. P.S.- I had a traumatizing hair experience last week and will be getting it redone today. I'll post pics if I don't look like Cruella Deville. Wish me luck! 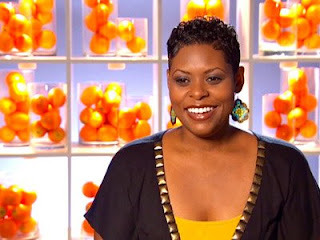 P.P.S.- My two favorite contestants on "The Next Food Network Star" are now gone! Debbie and Jamika have exited the show and frankly, this makes me sad. Girls, you will be missed! Ok, I seem to be in the fashion blogging mood today. So I thought I'd share with you one of my most recent and favorite small accessory finds. It is called the flower pendant and I knew upon seeing it that I just HAD to have one. They sell them at NY and Company and they are a very affordable accessory, at only $4.99 a pop! They look best paired with a solid 3/4 length cardigan or plain tank. They can easily take an outfit from cute to cuter and come in many colors. You can see how our friends at NY and Company paired them up with wardrobe pieces here. I wore mine with my cobalt blue sweater and cuffed jeans today. They seem pretty easy to replicate, so I think I'm gonna buy some art supplies this weekend and try to make some. I'm no Martha Stewart, so this could be interesting! The Linebacker Trend: Love or Loathe? I was walking around at Target yesterday and saw what can only be described as "linebacker chic." A cute, petite girl rounded the corner of the paper products isle wearing a pink dress with sleeves the size of Texas. I thought this trend died out in 1984, along with t-shirt ties and acid wash jeans, but I'm apparently wrong. The shoulder pads are back. Be afraid. Be very afraid. So I just HAD to go up to the Promenade to see if stores were actually carrying these ginormously shouldered dresses. To my horror, 5 of the 6 stores I stopped in were carrying frocks that reminded me of the days of Tiffany and Sixteen Candles. The more store windows I passed, it was like giant shoulder padded dresses and tops were jumping out, calling my name. Like an episode Twilight Zone: The Project Runway edition. I'm a self-admitted fashion maven. 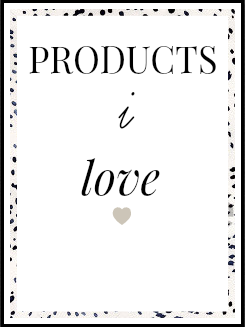 I love clothes, accessories, make-up, playing with my hair....you name it. So I'm always trying to stay on top of trends. Ladies, this is one style boat I'm not jumping on though. The thoughts of what this could do to my body shape send cold chills down my spine. So what do you think of the voluminous shoulders trend? Love it or loathe it? Let me know if you guys would be willing to give shoulder pads a try once more. If you are lucky enough to live in the gorgeous part of Arkansas known as the Northwest, you need to check out 360 Bentonville! This "with-it" website includes everything you need to know about Bentonville....events, promotions, jobs and even coupons. July 28, 10:00 – 11:00 a.m.
July 30, 10:00 – 11:00 a.m.
July 29, 1:00 – 2:00 p.m. 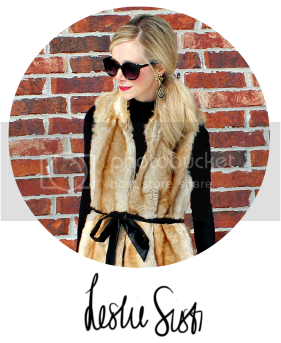 The blog has gotten a makeover today! You like? I love. This comes courtesy of ShabbyBlogs.com. Thanks for bearing with me this afternoon while I played around with different looks and I apologize if there were any errors while trying to access the blog. It's raining big time today, which means it's a good day for baking! I don't know what it is about rainy weather and wanting to bake things, but hey, to each her own. I'm planning on making a batch of these puppies as soon as I get off work today. Mrs. Susan Holifield makes these addictive little sweets called Praline Pecan Bars and they are amazing! I've gotten so many requests for this recipe lately that I thought I would post it here. Warning: They are extremely addictive and it's impossible to eat just one! 1. Break crackers up into 4 smaller pieces (per cracker). Place crackers on a 10 x 15, aluminum foil lined cookie sheet. 2. Bring sugar, butter and vanilla to a boil for 1 minute, 30 seconds. Add nuts. Pour mixture on top of the crackers and spread evenly. 4. Bake for 7-8 minutes. Cool for a few minutes on pan, then remove cookies from pan and cool on a wire rack. Aaron (Matthew's friend and fellow band member) and Matthew in Switzerland. Up high in the Swiss mountains. My mom picked up some really cool and unique souveniers from Paris' art district, which you can see above. My favorites were the multi-colored scarf and the paintings. Last night mom, dad, Matthew and I went to see Harry Potter and the Half Blood Prince at the old movie theater in Heber Springs. I felt like I was 10 years old again, going to see a movie with my parents at the Gem and I must say, it made me quite nostalgic. Oh, don't I sound old saying that? : ) It was such a good movie, although a little sad, and I really enjoyed "hanging out with the fam." I'll be on the road back to Northwest Arkansas this afternoon, so say a prayer for me for safe travels! Happy Sunday! Sarah represented Miss Quachita River in this year's competition. She is 23 years old and attends the University of Arkansas School of Law. 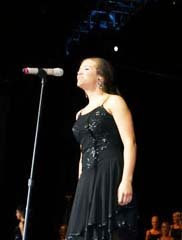 Her platform is "Paving the Way: Encouraging Higher Education" and she sang "The Prayer" as her vocal talent. Sarah will go on to represent the great state of Arkansas at the 2010 Miss America pageant in January. SO worth mentioning though....Anna won Miss Congeniality : ) Honors of Miss Congeniality are given to the girl who the other contestants believe is the most friendly and helpful throughout the week's competition. The Top Ten contestants were Amy Crain, Hannah Caldwell, Sarah Slocum, Jessica Herring, Hollyann Leigh Crum, Lindsey Allison Lee, Megan McClellan, Joi Chen, Allison Waldrip and Bethany Whitfield. Congratulations to ALL of this year's Miss Arkansas Winners! The final phase of the competition begins at 7:30 p.m. at the Convention Center in Hot Springs and a new Miss Arkansas will be crowned! Miss Lights of the Delta Katie Smart (Lifestyle and Fitness in Swimsuit), Miss OBU Bethany Whitfield and Miss Diamond Lakes Jessica Herring (Presence and Poise in Evening Gown), Miss University of Arkansas Amy Crain (Preliminary Artistic Expression in Talent) and Miss Heart of the Ozarks Megan McClellan (Lifestyle and Fitness in Swimsuit). Smart (Lifestyle and Fitness in Swimsuit), Whitfield and Herring (Presence and Poise in Evening Gown) and Crain (Artistic Expression in Talent). Check out the photos from last night below and see the winners, too. Anna performs her opening number for the judges on Prelim Night 2 at the Miss Arkansas pageant in Hot Springs, AR. Anna struts her stuff onstage for the crowd at the Convention Center. All that hard work and eating right paid off! You go girl! Sarah Slocum, Miss Ouachita River won the Preliminary Presence and Poise in Evening Gown Preliminary award; Lindsey Loughmiller, Miss University of Arkansas Fort Smith won the Preliminary Artistic Expression in Talent award; Miss Diamond Lakes Jessica Herring and Miss South Central Arkansas Ashley Walthall shared the Lifestyle and Fitness in Swimsuit Preliminary Award. 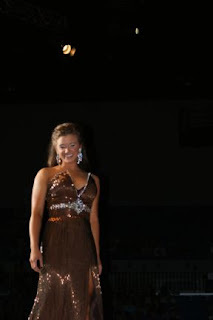 Alpha Awards were presented to Miss Metro Morgan Holt (Presence and Poise in Evening Gown). Miss Lights of the Delta Katie Smart, (Artistic Expression in Talent), Herring and Walthall (Lifestyle and Fitness in Swimsuit) Each of the winning contestants won an $100 scholarship. So last night was the first night of preliminary competition at the Miss Arkansas pageant and it was Anna's night to perform her talent. Anna sang "Gimme Gimme" from the Broadway musical "Thoroughly Modern Millie". I haven't heard from Seth or any of the others attending yet this morning, (I'm sure they're sleeping in after the long night of competition), but I'm sure she did great! I've added some pics below of last night's opening dance number, Anna's introduction and snap shots from her talent performance. Update: Pictured below are the winners from last night's prelim. First picture (from left to right) is of Hollyann Crum, Winner of the Lifestyle and Fitness in Swimsuit Preliminary Award; Joi Chen, Winner of the Preliminary Artistic Expression in Talent Award; and Megain Bowers, Winner of the Preliminary Presence and Poise in Evening Gown Award. Second picture (from left to right) is of the Alpha Award winners. These were Morgan Holt, Alpha Winner of the Lifestyle and Fitness in Swimsuit; Megan Bowers, Alpha Winner of the Presence and Poise in Evening Gown; and Joi Chen, Alpha Winner of the Artistic Expression in Talent. After eating my way through summer, (and thoroughly enjoying every moment of it), I have decided to start up my work-out routine again. I realize it is already mid-July, but as the old saying goes, there's no time like the present! I was doing great working out on an every-other-day-basis a couple of months ago, but since I travel most every weekend and LOVE to indulge in all the Southern treats of summer...sadly fitness has taken a back seat lately. I'm not exactly out of shape, just not as fine-tuned as I'd like to be. And though I have avoided putting on any weight, (Lord only knows how I avoided that one), it's only a matter of time 'til all of that wonderful homemade ice cream and peach cobbler catches up with me! Haha! And I can tell my jeans are a bit more snug around the waist. I'm not one of those girls who just LOVES working out....nope, not this girl! So I won't pretend I can't-hardly-wait to get started again : ) But there is a small chance I will have to be seen in an actual swimsuit next month (the horror of horrors), so I best get going. Luckily, I'm a devout Shape Magazine reader and they always have solutions at the ready for real women, like the one I found. It's called the 30 Day Shape Up Plan and it's supposed to be great! I subscribed tonight and received my first week's eating and workout plan promptly after I joined. And, (gasp! ), it wasn't completely terrible! Only 3 days of actual exercise per week and easy meals like low-fat PB & J and chicken-veggie stir fry. All meals are able to be prepped in only 20 minutes or less, a factor that's CRUCIAL to working gals like myself! And guess what?? The plan includes carbs! My favorite edible thing in the whole wide world : ) I was thrilled to find out that I won't have to eat seaweed puree or soy burgers and I would get to eat more than 400 calories a day! Victory! How many of us have had that moment where you've been on a super strict diet for about a week and suddenly get "that" craving? You know, that craving where you want to eat a pound of cake batter and you WANT IT NOW! Then you raid the fridge looking for anything with starch or sugar, only to find that all you have is a jar of apricot jelly, but you eat that anyway because you're STARVING!? Ummm, yes, I've experienced that moment. Wanna join me? Sign up here and keep me posted on your progress. I'll be giving frequent updates on my progress and let you know if I have any luck with the plan. So Sunday marked the start of the annual Miss Arkansas pageant week in Hot Springs. I must admit, I don't really keep up with the pageant circuit myself and really haven't had a reason to in years past. Save for a couple of really minor high school beauty contests, (in which I actually placed 3rd! 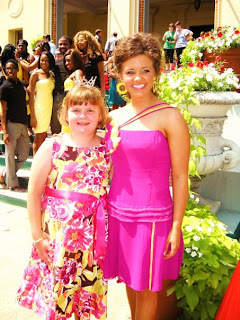 ), I've never really been a "pageant girl". I know what you're thinking....you're a southern girl and NEVER been in pageants?! It's true. LOL. However, I will definitely be keeping up with the Miss Arkansas pageant this year because a dear friend of mine from Warren, AR is representing ASU- Jonesboro in this year's contest! Her name is Anna Callaway, she is 21 years old and is my boyfriend Drew's, brother's girlfriend. Did you get all that? Ha! She is competing for the title this year along with 44 other talented, beautiful young women from across the great state of Arkansas. Her platform is called "N.I.C.E." which stands for "National Institute of Character Education. It is a platform that I know is near and dear to her heart and she truly believes in it. Please say a prayer for Anna this week and keep your fingers crossed that she will do great! I'll keep you updated on everything starting Wednesday night, which begins the Preliminary competitions. The MAIN EVENT begins on Saturday night at 7:30 and, although I have to work this week and cannot attend, Drew and his family will be there in my place and keep me updated via cell phone throughout the whole thing. You can visit the Miss Arkansas Website and learn more about the contestants here. Also, I've posted some pics. Enjoy! Due to the craziness of Friday at work and then the road trip to Heber, I haven't had time to due an update yet this weekend. My apologies for my tardiness ya'll! Friday it was one thing after another at work, however I was able to leave at 2:00, which was great! I love being able to be off early on Fridays (yet another perk of my job) and it's great being able to get on the road a little early to beat the weekend traffic out of town. Drew and I had planned to go to Heber Springs (my home town) for the weekend. My mom and brother are in Europe on tour with my bro's high school band. We wanted to come visit Dad and the rest of the family, since we spent last weekend with Drew's family and so we decided to make the trek to Heber on Friday afternoon. I packed in only 15 minutes (quite a feat for me!) and Drew and I left Bentonville at 2:30. Traffic was so thick, even worse than last weekend, which was the 4th of July. We arrived in Heber around 6:00 p.m. and my Memaw and our family friend Miss Jan had prepared a traditional southern dinner for us! We had fried chicken, fried potatoes, biscuits, macaroni and cheese, salad and corn on the cob with butter (I'm getting hungry just thinking about it again : ) Then to complete our meal, we enjoyed homeade bluberry pie with vanilla bean ice cream and hot coffee. I think we all gained 10 pounds, but boy was it ever great! Today, Drew and I had breakfast with my dad and hung around the house for a couple hours this morning, basically just being lazy and enjoying our Saturday. We went into town around 2:00 and visited a few local stores and art galleries and, of course, Sonic! I hope everyone is having a great weekend. I've posted some pics here for you to see of last weekend's Fourth of July Celebration with Drew's family in Paragould, AR. 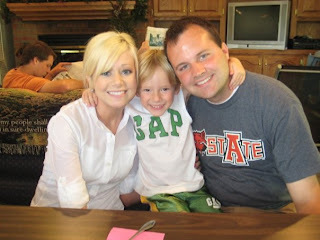 His family from Dallas, TX visited for the weekend, including his adorable 4 year old cousin, Cooper. Note: The pic of Cooper and I looks like I'm holding a cigarette, but I'm DEFINITELY NOT! It is actually my cell phone. LOL! Someone pointed that out to me, so I wanted to clarify. I'm totally against smoking, ewww. "For you were once darkness, but now you are light in the Lord. Live as children of light." "When you ask, you do not receive, because you ask with wrong motives, that you may spend what you get on your pleasures." When we pray to God, let's make sure we're asking for things for the right reasons. It's hard to see the blessings in tough situations sometimes. We can't understand why things turn out the way they do and occasionally we blame God if things don't go the way we had hoped. It's important for us to remember that God has a plan for all of us and he always has our best interests in mind. Always trust that God will provide exactly what you need at exactly the right time; what we get may not always be what we asked for, but will always be what we were meant to have! So I thought I would share with you all about my 83 year old grandfather, who I like to refer to as "Papaw". He is definitely one of the smartest men I know and can fix ANYTHING. He was a HAMM radio operator for years, (something I found to be extremely cool when I was a little girl), an expert mechanic and has always kept up with the latest in technology. He has been an active internet user for a couple years now and I have always enjoyed e-mailing back and forth with him. Today I was thrilled to receive a Facebook "Friend Request" from none other than Gerald Lacy, my very own Papaw! And though I agree wholeheartedly that nothing can ever replace a handwritten "Thank You" note or Birthday Card (I am a Southern girl, after all), I am a firm believer in changing with the times and using technology to our advantage. And so is Papaw. He inspires me daily with his eagerness to learn new things and his willingness to use the internet and social media. He is completely unintimidated by new technology and I truly believe that this is what has kept him so sharp. I have no doubt that Papaw will be the most popular guy on Facebook in no time! Let us not be afraid to try new things and enjoy the tools of modern times. I am only 24 and admit that even I am intimidated sometimes, but I feel it's essential to understand how the internet works these days. Hence my reason for starting this blog. So here's to you Papaw, for showing us all how it's done! "Because of the Lord's great love we are not consumed, for his compassions never fail. They are new every morning; great is your faithfulness." I love this verse of the Bible because it truly sums up just how much God cares for us. Every day, no matter what trials or tribulations we face, God is with us. His love is never ending and his compassion never stops. Take a moment out of your busy day to thank God for the ways in which he has blessed you! 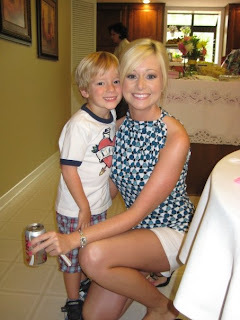 It's my very first blog post and the innagural post of A Blonde Ambition. Let me start by saying, blogging is something I never thought I would do. I began my first "real" job a year ago after my college graduation, (GO ASU! ), and began working for a major bank in Arkansas. Part of my job involves adminning a blog and I have grown to really enjoy it! I'm actively involved in Facebook and enjoy reading the blogs of other young women, especially those of Kelly Stamps http://www.kellyskornerblog.com/ and Tiffany Selvey http://songbirdtiff.blogspot.com/, also fellow NWA-ers. I hope you will all follow me on my blogging journey as it will no doubt be an interesting one! Feel free to share your own stories and blogging experiences with me, too!